We are what we see, what we hear, and what we are taught. The value and meaning of our own human life and the life of others is much in question. Our entire society must undergo a virtual sea change and that will require wise leadership, if there is any to be had. Exquisitely and succinctly put, Carol. 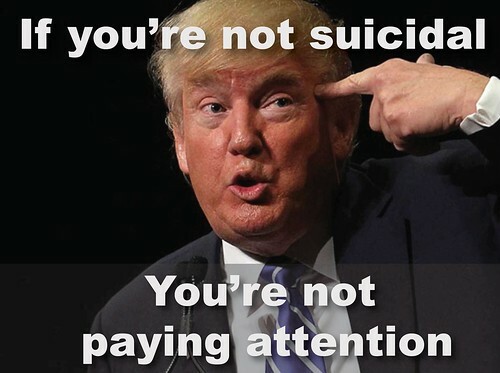 I actually noticed after posting this article that the period in which the study said the suicide rate had doubled, was in fact, during the Obama Administration. So, the picture of Trump I have accompanying the post may be a bit misleading. My apologies for that (although I wouldn't be surprised if the trend has accelerated since our current President took office.